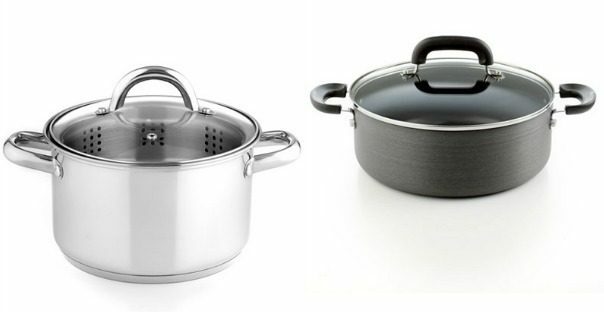 Tools of the Trade Cookware Only $4.99 Each (Was $50) After Rebate! You are here: Home / Great Deals / Tools of the Trade Cookware Only $4.99 Each (Was $50) After Rebate! Through tomorrow, May 30th, Macy’s.com is giving you $10 off your $25 purchase when you use a special promo code at checkout. Macy’s also has select Tools of the Trade cookware on sale with prices marked down as much as 50% off! On top of that, there is a $10 mail-in rebate available for select Tools of the Trade items. Win, Win, Win! Tools of the Trade Hard Anodized Nonstick 5 Qt. Covered Chili Pot Was $50, now $24.99! Final: $4.99 – for a $50 pan! Tools of the Trade Stainless Steel 4 Qt. Stockpot with Steamer Insert Was $50, now $24.99! For either of these items, if you buy online and pickup in store you bypass shipping charges and you’ll get a 15% or 20% Wow Pass for your next in store purchase!